We gather to call to the order of deacons these 7 young men from various dioceses in Ireland and from the Irish Redemptorist Province. We pray that the Holy Spirit will be with them with his strength and comfort; that he will accompany them in their witness and service as deacons on their path to priestly ordination. We join in the joy of their families and friends and their dioceses of origin; we join in the joy of the communities from which they have received their faith as well as of those who here in Maynooth and in the Redemptorist province who have been their guides in the years of the formation. We have listened to the Gospel reading which is taken from the farewell address of Jesus. There is an air of mystery in the words of Jesus. He is with his disciples and he is seen by all. In a short time, however, things would change. He tells them that he will go away. However he will not leave his disciples orphans. The world, he tells us, will no longer see him, but he will be present with his believers. Indeed there is a sense in which the Gospel is telling us that Jesus will be with his disciples in a special way precisely in those moments in which the world no longer sees him. Right throughout history, the disciples of Jesus have been called to live their discipleship in a variety of situations and cultures. These range from moments where the Christian message has really impacted on society and culture, to other moments marked more by indifference and cries that faith and the values that it espouses are irrelevant, to moments of outright persecution and hostility. Yet Jesus tells us that he will be present with those who believe in him, in every culture, in every human context. He will be present in the individual life of every believer and of the community of believers in days of joy and in days of darkness, in days of intense communion and in days when our minds and our lives drift away into the distractions and the misrepresentations of life. This morning we pray that these seven men shortly to become deacons will always experience the presence of the spirit of Jesus in their lives and ministry and will never be prevailed over by the tensions and anxieties they will inevitably encounter in their ministry. Your ministry in Ireland in the years to come will not be easy. We are at a truly crucial moment in the life of the Irish Church. These words are not just platitudes. The next few years will be among the most crucial in the long history of the Irish Church. There is little time to procrastinate or simply allow things to drift without direction. The Church of the future will have to change and inevitably will be different. The Church will face challenges, but we should not allow change and challenges to prevail over our faith that the Spirit of Jesus lives with us and in us. The overall culture and demographics of Irish society are changing. It will be very interesting to see the results of the National Census as to how many people in Ireland are Catholic and who wish to be called Catholic. On a given Sunday only about 18% of the Catholic population attends Mass in the Archdiocese of Dublin. That is somewhat lower than in other parts of the country and it does not take into consideration the age profile and the lack of young people in many parishes. Many young people, despite years of religious education, have only marginal interest in the message of Jesus. Many who come to us today possess only a sort of cultural Catholicism which can easily deceive us about the depth of people’s faith. Faith in Jesus Christ and in his Church is not a free-for-all of opinions in which anything goes. Faith in Jesus has content and context. It is about knowing Jesus intimately. It would not be wrong to paraphrase the words of today’s Gospel and say that in many dimensions of Irish culture “the world no longer sees and finds Jesus”. We live in a world which lives so often as if God did not exist. This is not to say that those who no longer have faith in Jesus are not good, idealistic people of integrity. Indeed they often look with sadness and are at times scandalised at the failings of believers and of the institution of the Church. They do not find in us authentic witnesses to the presence of Jesus in our own lives. The challenge of witnessing to faith and hope in today’s world is the challenge of addressing those who find belief not just not easy, but irrelevant. This challenge requires dialogue rather than imposition; we must seek to identify the seeds of the transcendent in today’s society, building on every expression of openness to something which goes beyond the measurable. As we heard in the second reading, we must respond “with courtesy and respect and with a clear conscience”. We must engage with different longings for spirituality and forge an encounter between such longings for the spiritual and for a God with the fact that God has spoken to us in Jesus Christ, that he has revealed himself in Jesus Christ and in that revelation he has changed our lives and changed our understanding of God. Yet, as I have said, faith in Jesus Christ and in his Church is not a free-for-all of opinions in which anything goes. We cannot allow our own wisdom to substitute reflective knowledge and love of the word of God. Jesus teaches us that the Spirit is given to us to guide us to the fullness of truth. How does that process take place? Jesus reminds us that in every situation that we encounter, the Spirit will recall for us the words of Jesus and help us to make them our own in the deepest sense. He will help us to make the words of Jesus the principle of interior life. We must daily find moments to know the word of God, to reflect prayerfully on the Word of God, and especially the Gospels. Your ministry as deacons is never just a job, but a real calling of your entire person. The only true response to the call to ordained ministry is an integral and authentic response of your whole life. This total dedication and interiorization is especially shown in the practice of celibacy which you, as deacons, take on yourselves today in a special way as a sign of total commitment to Jesus. Celibacy is not just renunciation of something; it is a positive attitude of commitment. The priest is freed from the personal care for a family in order to be able to give himself with all his heart to pastoral ministry. The priest renounces a legitimate intimacy so that he can be more intimate in his love of Jesus. The gift of the spirit comes only, we have heard, to those who keep the commandments of Jesus. Christianity is however not a faith of abstract rules, it is a faith about love. Jesus great commandment is that of love. That love however is not a love of self-concern, or superficial infatuation or narcissism, but the love of God who gives himself for us and who takes up his place in our lives. The Spirit will take up abode with us and in us. The Spirit will enable us to recognise Jesus even in a culture which ignores him or feels no need of him. The Spirit of truth is with us so that we can discover the truth about life, the real life of Jesus who is with us. The Church will face difficulties. You as deacons will face many difficulties in your ministry. Yet you are called to be ministers of hope precisely at this stage in human history, where many find it difficult to know where to ground their hope. The second reading spoke about hope in the context in which believers were persecuted and slandered. Hope however is not just vague, empty optimism. There are many reasons in today’s world not to be optimistic. The forces of evil are as present today as ever. We see this is a self-centredness which entraps people in greed. We see this in those who espouse violence, whether criminal or political or simply senseless violence. The evil of violence is the opposite to hope. It is somehow to think that evil can be overcome by evil. But evil plus evil adds up only to being drawn ever more deeply into evil and making the hope of the good even less tangible! Hope is not just a vague sentiment. The reading reminded us that as Christians we must be able to give the reason for the hope that is in us. We must be able to formulate the reasons for our hope and witness to the hope that is in us, through our understanding of the Word of God and through the way we live. We can only lead a generation which feels no need to be saved to turn to a God who saves, if we can show that God’s redeeming power does not dispossess us of our humanity but enables us to see where true values lie, to understand the mystery of our human identity. I believe that so many fail to make that leap of faith, because we as a community of believers have never made that leap to the full. We have never fully abandoned ourselves to the God who can make us free, but still cling on to the things we falsely feel can bring us security. Faith is always a leap in the dark, but in the confidence that Jesus has not left us orphans. We will never be able to lead others into the depths of faith and the joy of our hope if we remain entrapped in the limitedness of our current world vision. The coming years will be challenging years for the Church in Ireland. They must however be years of renewal. 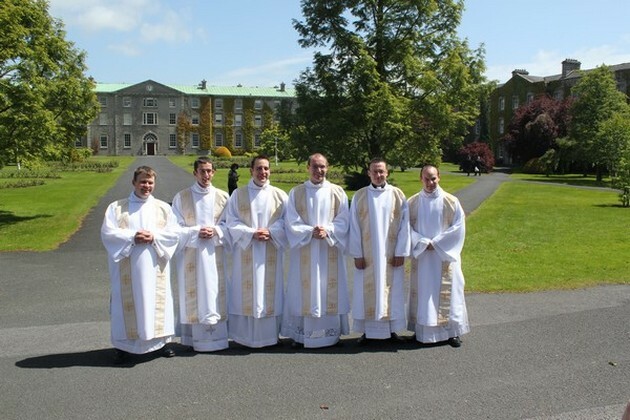 As future priests you will play a crucial role in that renewal. I wish you every blessing in your ministry. I encourage you to reach out to the coming generations, presenting them in unambiguous terms the teaching of Jesus and challenging them not to be afraid to let the message of Jesus change their hearts. Once again, I thank and congratulate your parents and your families and friends, to the ecclesial communities where your faith was nourished. You received the faith through them. Yours now is the challenge to be an instrument in passing on the faith you have received to the generations to come.